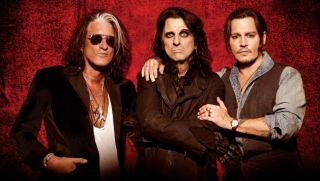 The Alice Cooper-Joe Perry-Johnny Depp supergroup will release ‘Rise’ in June. Alice Cooper will also head out on a summer solo run with Halestorm. Joe Perry Shares New Song and Video, "Quake"
The track features Extreme frontman Gary Cherone on vocals. The guitarist will hit the road with a band that includes Aerosmith's Brad Whitford and Extreme vocalist Gary Cherone. Legendary rockers also announced a 2019 Las Vegas residency. Watch Foo Fighters, Joe Perry and Liam Gallagher Play the Beatles' "Come Together"
Aerosmith have cancelled the last four South American dates of their AeroVederci tour, as singer Steven Tyler recovers from "unexpected medical issues." This Is Spinal Tap has been celebrated as the ultimate metal mockumentary. But not everyone got the joke.